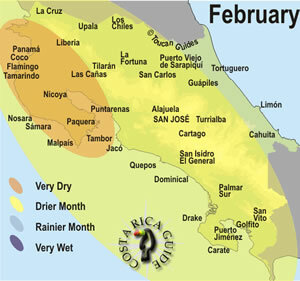 Costa Rica February rainfall patterns. February is solidly in the dry season for the central and Pacific zones. It’s almost as popular than January but availability is reasonable and there are no peak season surcharges like at Christmas, New Years and Spring Break/Easter). Monkeys would rather hang around in the sun and there are a number of seasonal migrants in residence making February an excellent time for wildlife watching. February is the middle of the dry season in Costa Rica’s Central Valley and Pacific beaches. The western and central regions of Costa Rica have sunny hot weather and nearly no rain. What little rain falls usually comes as afternoon or evening showers. A February weather phenomenon is strong winds called “Papagayos.” These winds are most common in the northwest and are caused by cooler, dry air moving down from the north and displacing the moist, warm dense, tropical air mass. The air moves across Costa Rica as a result of the pressure difference and accelerates through gaps in the central mountain ranges and can exceed 100 kph. Because there’s no rain on the Pacific side temperatures on the beaches and in the lowlands climb. Highs around 86 to 94 °F (30-35 °C) with lows only dropping a few degrees to 76 to 84 °F (25-29 °C) overnight can make heading to the mountains for part of your vacation attractive. Daytime temperatures around the central valley are a very pleasant 75 to 85 °F (24-29 °C) this time of year. It’s wetter on the Caribbean side of the central mountains and the likelihood of temporales del Atlantico (polar air pushes across the Gulf of Mexico picking up heat and moisture then deposits it as continuous days of rain) is still fairly high. Temperatures on the Caribbean side are moderated by the rains and a few degrees lower – hot instead of really hot. Surf conditions depend strongly on weather conditions and these regional descriptions can help you find the best waves in February. The best lodges and resorts normally sell out in February. In 2018 we spent the entire month traveling around and found that even with our connections and a whole office full of travel advisors working for us we were scrambling for reservations a few times. The extraordinary hurricane season that devastated the beaches, resorts and hotels of the Caribbean in late 2017 prompted many travelers to switch from their Virgin Islands, Barbuda, or Puerto Rico tradition and try Costa Rica instead. 2019 is already looking even busier and will doubtless establish new occupancy records by quite a bit. If you’re thinking about a last minute trip you can probably find accommodations a couple of weeks in advance if you’re a little flexible. If you have your heart set on a particular property on specific dates you should plan to reserve at least three to six months in advance. Costa Rican School holidays end at the end of January or in early February so there’s less local competition for activities and accommodations. February is the high season but not the peak so you’ll find slightly lower prices and better availability that may give you the option of choosing a less luxurious room that better matches your budget or the best view if you’re splurging. Our recommended itineraries each include details on the popularity of the destinations. Reasonable airfares are available for advance purchasers, but most have sold out by December. Occasionally airfares for February go on sale a few weeks in advance especially when temperatures have been unseasonably warm in the northeastern U.S. and Canada. February is one of the alternatives to the crowds in late December and early January. If February dates don’t work for you but you want to stick with the Dry Season then take a look at early March before the Spring Break and Easter crowds arrive. NOAA projects that early 2019 will be a mild ENSO positive (El Niño Southern Oscillation) which means a bit drier and hotter on the Pacific with the typical tropical scattered rain and high humidity on the Caribbean. “Summer” School Holidays—The long public school vacations in Costa Rica run from the middle of the second week in December through the beginning of the second week in February. Expect families on vacation and bigger crowds at the beach. Exact dates can be found on the Ministerio de Educación Pública calendar. A detailed explanation and legend is also included at the bottom. approximate exchange rate ¢612 per $U.S. Carnival and Festival del Mar – A week of local celebrations in Puntarenas and Quepos including street fairs and fiestas, dancing and sporting events. The phase of the moon, and the moon and sun rise and set times for planning turtle viewing or a night hike (best under the dark skies of a new moon when nocturnal animals are most active). Times for each high and low tide along the outer Pacific coast (gulfs and bays vary). Average height 8 feet (2.5 meters). Tides on the east coast occur about 2 hours earlier. However, the average height is only 8 inches (0.2 meters) so levels in the Caribbean Sea do not significantly impact most activities. Natural events are shown as shaded icons for quetzals (nesting), turtles (nesting), and humpback whales (calving) on each coast. The more solid color shown the more likely the event, the more shaded the less likely. Baby turtles hatch (usually at night) after approximately 50-70 days incubation so look for nesting activity on the calendar two months prior to your visit if you’d like to see the little ones popping out of the sand.. Holidays – Bold indicates a government & bank holiday when most businesses are closed and buses may run on limited schedules. Fiesta and local festival dates are approximate – most include events spread over a week or two so check the schedule locally for more information. toll free Costa Rica travel desk! June in Cost Rica – Best Time to Travel? December in Costa Rica – Best Time to Visit?